Heal your body and soothe your creative soul with these deliciously colorful smoothie pops. Made with a rainbow of fresh fruits and blended with just a bit of yogurt and almond milk, they’re a terrific, healthy addition to any party menu where color is key. 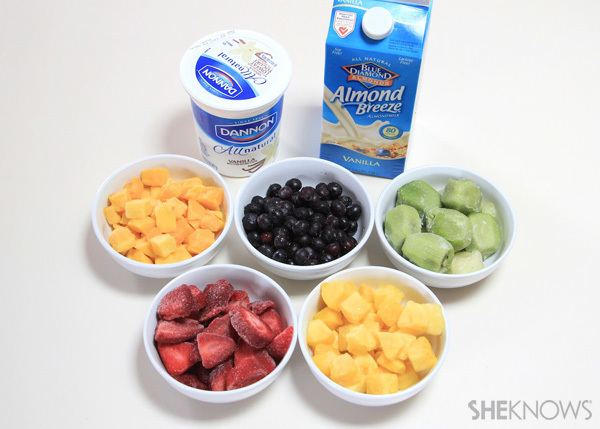 Use a rainbow assortment of five different fruits. I prefer frozen chunks of fruit because it makes the mixtures thicker. 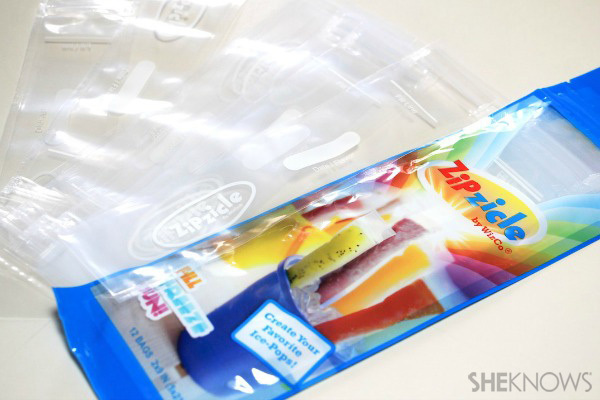 I found these freezer ice-pop bags at Zipzicles.com. They worked perfectly. 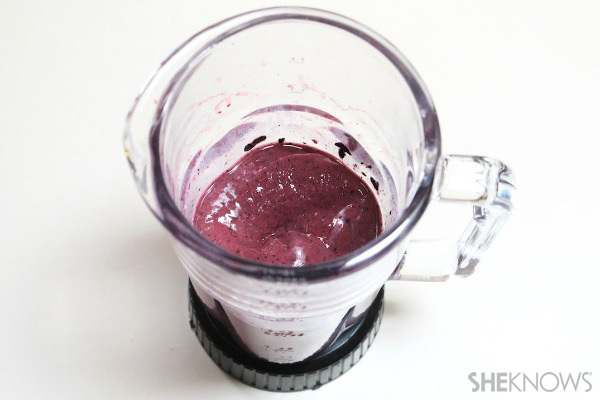 It’s as easy as blending up a smoothie, but the end result is way more fun! Who said pastry bags were just for frosting? These make it super easy to fill up the ice-pop bags without all the mess. and work your way up the rainbow until you get to strawberry. 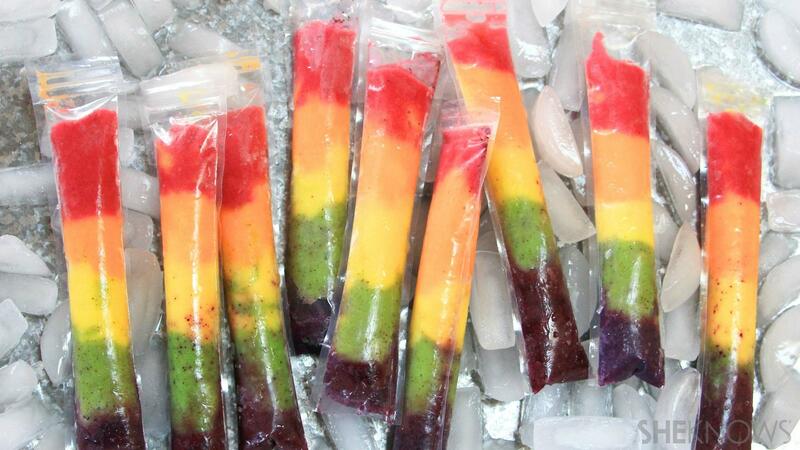 Keep them in your freezer for a rainbow-inspired snack whenever the craving hits. In a blender, mix each frozen fruit with 1 cup vanilla yogurt and 1/2 cup almond milk. Add more almond milk if needed to blend, but the smoothies should be fairly thick. Pour each blended fruit smoothie into a sealed pastry bag and close the tops with rubber bands. 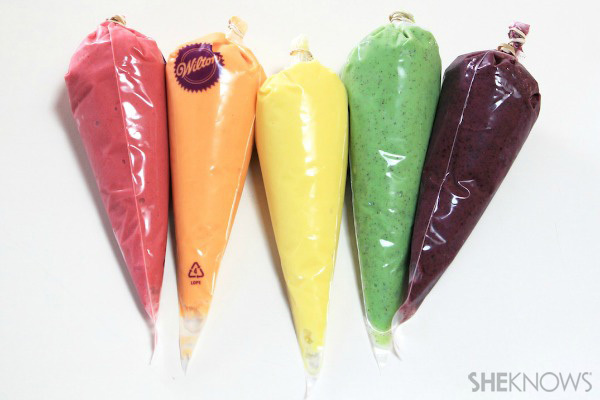 You want your smoothies to be fairly thick so that they don’t mix together when you squeeze them into the ice-pop bags. If needed, put them in the freezer for about an hour to help stiffen the mixtures. Place the bags upside down in cups, and cut the tips of the pastry bags off. 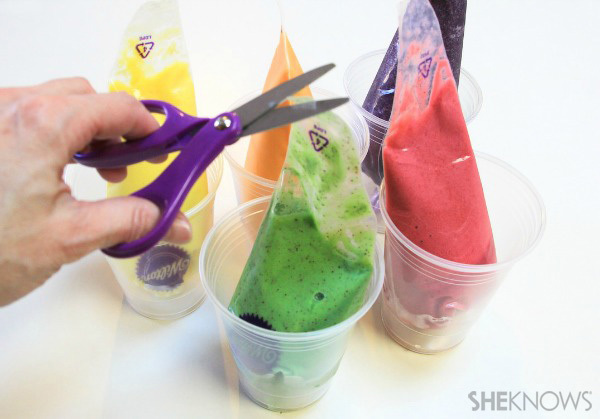 Squeeze a small amount (about 1 tablespoon/1 inch) of the blueberry smoothie into the bottoms of the Zipzicle bags. As you fill the bags, you can place them upright inside cups to keep the mixtures from sliding. Next, squeeze the kiwi smoothie on top of the blueberry in all of the bags. Continue this process with the pineapple, mango and strawberry smoothies until all of the bags are full. Seal the bags closed and freeze for at least 4 hours.